Optical coherence tomography angiography (OCTA) is an exciting new imaging technology that allows for non-invasive non-dye-based visualization of blood flow in the posterior pole. The technology has been used to image a variety of chorioretinal disorders including choroidal neovascularization in age-related macular degeneration, diabetic retinopathy, retinal arterial occlusion, retinal vein occlusion, and macular telangiectasia type 2. 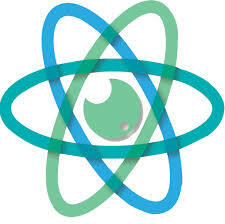 Continued advances in the software will improve the quality of OCTA and reduce image artifacts. Caroline R Baumal has nothing to declare in relation to this article. She serves on an advisory board for Allergan (2015/2016). Talisa de Carlo has nothing to declare in relation to this article. The publication of this article was supported in part by an unrestricted grant from Research to Prevent Blindness and Massachusetts Lions Club. The views and opinions expressed are those of the author and do not necessarily reflect those of of Research to Prevent Blindness or Massachusetts Lions Club. OCTA is a novel imaging modality that depicts retinal and choroidal vascular flow in great detail. The ability to segment OCT angiograms into the different vascular layers may improve understanding of disease pathogenesis and has already demonstrated that the deep inner retinal plexus appears to be more affected than the superficial plexus in some retinal disorders. OCTA can demonstrate many posterior pole vascular abnormalities similarly to FA, but OCTA is non-invasive, fast, and does not require dye injection. Future OCTA studies will elucidate more on ophthalmologic disease processes and therapies. 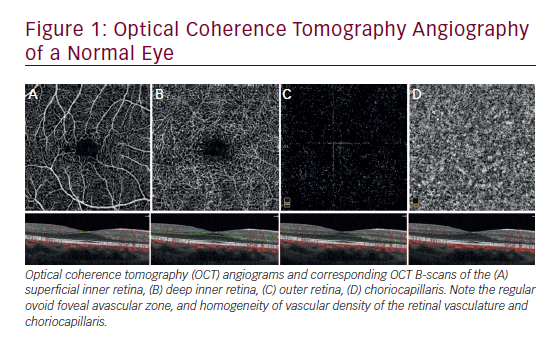 1. de Carlo TE, Romano A, Waheed NK, Duker JS, A Review of Optical Coherence Tomography Angiography, , 2015;1(1):5. 2. Matsunaga D, Yi J, Puliafito C, Kashani AH., OCT Angiography in Healthy Human Subjects.Ophthalmic Surg Lasers Imaging Retina, 2014;45:510–5. 3. Mastropasqua R, Di Antonio L, Di Staso S, et al., Optical Coherence Tomography Angiography in Retinal Vascular Disease and Choroidal Neovascularization, J Ophthalmol, 2015:1–8. 4. Kim DY, Fingler J, Zawadzki RJ, et al., Optical Imaging of the Chorioretinal Vasculature in the Living Human Eye, Proc Natl Acad Sci U S A, 2013;110:14354–9. 5. Schwartz DM, Fingler J, Kim DY, et al., Phase-Variance Optical Coherence Tomography, Ophthalmology, 2014;121:180–7. 6. Huang Y, Zhang Q, Thorell MR, et al., Swept-Source OCT Angiography of the Retinal Vasculature Using Intensity Differentiation-Based Optical Microangiography Algorithms, Ophthalmic Surg Lasers Imaging Retina, 2014;45:382–9. 7. Spaide RF, Klancnik JM, Cooney MJ, Retinal Vascular Layers Imaged by Fluorescein Angiography and Optical Coherence Tomography Angiography, JAMA Ophthalmol, 2015;133:45–50. 8. Choi W, Mohler KJ, Potsaid B, et al., Choriocapillaris and Choroidal Microvasculature Imaging with Ultrahigh Speed OCT Angiography, PLoS ONE, 2013;8:e.81499. 9. de Carlo TE, Salz DA, Waheed NK, et al., Visualization of the Retinal Vasculature Using Wide-field Montage Optical Coherence Tomography Angiography, Ophthalmic Surg Lasers Imaging Retina, 2015;46:611–6. 10. 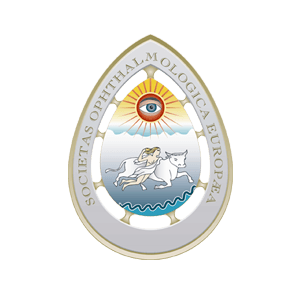 Carpineto P, Mastropasqua R, Marchini G, et al., Reproducibility and Repeatability of Foveal Avascular Zone Measurements in Healthy Subjects by Optical Coherence Tomography Angiography, Br J Ophthalmol, 2015;doi:10.1136/ bjophthalmol-201. [Epub ahead of print]. 11. Hwang TS, Gao SS, Liu L, et al., Automated Quantification of Capillary Nonperfusion Using Optical Coherence Tomography Angiography in Diabetic Retinopathy, JAMA Ophthalmol, 2016;doi:10.1001/jamaophthalmol.2015.5658. [Epub ahead of print]. 12. Agemy SA, Scripsema NK, Shah CM, et al., Retinal Vascular Perfusion Density Mapping Using Optical Coherence Tomography Angiography in Normals and Diabetic Retinipathy Patients, Retina, 2015;35:2353–63. 13. Spaide RF, Fujimoto JG, Waheed NK, Image Artifacts in Optical Coherence Tomography Angiography, Retina, 2015;35:2163–80. 14. Chen FK, Viljoen RD, Bukowska DM, Classification of Image Artifacts in Optical Coherence Tomography Angiography of the Choroid in Macular Diseases, Clin Experiment Ophthalmol, 2015; doi:10.1111/ceo.12683. [Epub ahead of print]. 15. Zhang A, Zhang Q, Wang RK, Minimizing Projection Artifacts for Accurate Presentation of Choroidal Neovascularization in OCT Micro-Angiography, Biomed Opt Express, 2015;6:4130–43. 16. de Carlo TE, Bonini Filho MA, Chin AT, et al., Spectral Domain Optical Coherence Tomography Angiography (OCTA) of Choroidal Neovascularization, Ophthalmology, 2015;122:1228–38. 17. 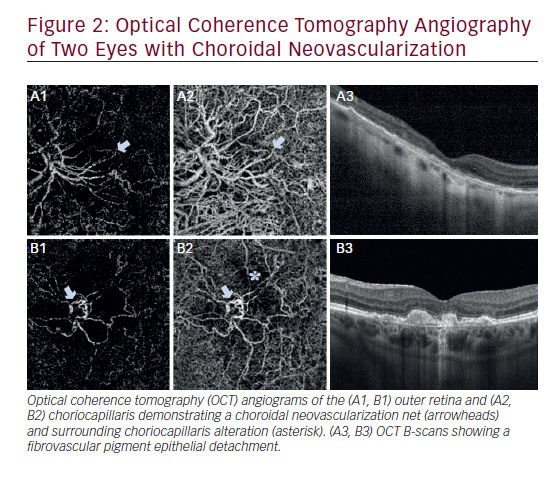 Bonini Filho MA, de Carlo TE, Ferrara D, et al., Association of Choroidal Neovascularization and Chronic Central Serous Chorioretinopathy with Optical Coherence Tomography Angiography (OCTA) Detection,JAMA Ophthalmol, 2015;133:899–906. 18. de Carlo TE, Moult E, Choi W, et al., Non-Neovascular Age- Related Macular Degeneration. In: Lumbroso B, ed., Clinical OCT Angiography Atlas, 1st edn, New Delhi, India: Jaypee Brothers Medical Publishers, 2015;75–88. 19. 19. Kuehlewein L, Bansal M, Lenis TL, et al., Optical Coherence Tomography Angiography of Type 1 Neovascularization in Age-Related Macular Degeneration, Am Journal Ophthalmol, 2015;160:739–48. 20. Jia Y, Bailey ST, Wilson DJ, et al., Quantitative Optical Coherence Tomography Angiography of Choroidal Neovascularization in Age-Related Macular Degeneration, Ophthalmology, 2014;121:1435–44. 21. Srour M, Querques G, Semoun O, et al., Optical Coherence Tomography Angiography Characteristics of Polypoidal Choroidal Vasculopathy, Br J Ophthalmol, 2016; doi:10.1136/ bjophthalmol-2015-307892. [Epub ahead of print]. 22. de Carlo TE, Rosenblatt A, Goldstein M, et al., Vascularization of Irregular Retinal Pigment Epithelial Detachments in Chronic Central Serous Chorioretinopathy Evaluated with OCT Angiography, Ophthalmic Surg Lasers Imaging Retina, 2016;47:128–33. 23. Quaranta-El Maftouhi M, El Maftouhi A, Eandi CM, Chronic Central Serous Chorioretinopathy Imaged by Optical Coherence Tomography Angiography, Am J Ophthalmol. 2015;160:581–7. 24. Miere A, Querques G, Semoun O, El Ameen A, Capuano V, Souied EH et al., Optical Coherence Tomography Angiogrpahy in Early Type 3 Neovascularization, Retina, 2015;35:2236–41. 25. Kuehlewein L, Dansingani KK, de Carlo TE, et al., Optical Coherence Tomography Angiography of Type 3 Neovascularization Secondary to Age-Related Macular Degeneration, Retina, 2015;35:2229–35. 26. Inoue M, Balaratnasingam C, Freund KB, Optical Coherence Tomography Angiography of Polypoidal Choroidal Vasculopathy and Polypoidal Choroidal Neovasculariazation, Retina, 2015;35:2265–74. 27. Muakkassa NM, Chin AT, de Carlo T, et al., Characterizing the Effect of Anti-Vascular Endothelial Growth Factor Therapy on Treatment-Naïve Choroidal Neovascularization Using Optical Coherence Tomography Angiography, Retina, 2015;35:2252–9. 28. Baumal CR, de Carlo TE, Waheed NK, et al., Sequential OCT Angiography for Diagnosis and Treatment of Choroidal Neovascularization in Multifocal Choroiditis, JAMA Ophthalmol, 2015;133:1087–90. 29. Marques JP, Cost JF, Marques M, et al., Sequential Morphological Changes in CNV Net After Intravitreal Anti-VEGF Evaluated with OCT Angiography, Ophthalmic Res, 2016;55:145–51. 30. Lumbroso B, Rispoli M, Savastano MC, Longitudinal Optical Coherence Tomography Angiography Study of Type 2 Naïve Choroidal Neovascularization Early Response After Treatment, Retina, 2015;35:2242–51. 31. Coscas G, Lupidi M, Coscas F, et al., Optical Coherence Tomography Angiography during Follow-Up: Qualitative and Quantitative Analysis of Mixed Type I and II Choroidal Neovascularization After Vascular Endothelial Growth Factor Trap Therapy, Ophthalmic Res, 2015;54:57–63. 32. Miere A, Semoun O, Cohen SY, et al., Optical Coherence Tomography Angiography Features of Subretinal Fibrosis in Age- Related Macular Degeneration, Retina, 2015;35:2275–84. 33. Toto L, Borrelli E, Di Antonio L, et al., Retinal Vascular Plexuses’ Changes in Dry Age-Related Macular Degeneration, Evaluated by Means of Optical Coherence Tomography Angiography, Retina, 2016; doi:10.1097/IAE.0000000000000962. [Epub ahead of print]. 34. Choi W, Moult E, Waheed NK, et al., Ultrahigh-Speed, Swept- Source Optical Coherence Tomography Angiography in Non- Exudative Age-Related Macular Degeneration with Geographic Atrophy, Ophthalmology, 2015;122:2532–44. 35. de Carlo TE, Moult E, Choi W, et al., Diabetic Retinopathy. In: Lumbroso B, ed., Clinical OCT Angiography Atlas, 1st edn., New Delhi, India: Jaypee Brothers Medical Publishers, 2015;120–31. 36. de Carlo TE, Chin AT, Joseph T, et al., Distinguishing Diabetic Macular Edema from Capillary Nonperfusion Using Optical Coherence Tomography Angiography, Ophthalmic Surg Lasers Imaging Retina, 2016;47:108–14. 37. Ishibazawa A, Nagaoka T, Takahashi A, et al., Optical Coherence Tomography Anigography in Diabetic Retinopathy: A Prospective Pilot Study, Am J Ophthalmol, 2015;160:35–44.e1. 38. Couturier A, Mané V, Bonnin S, et al., Capillary Plexus Anomalies in Diabetic Retinopathy on Optical Coherence Tomography Angiography, Retina, 2015;35:2384–91. 39. 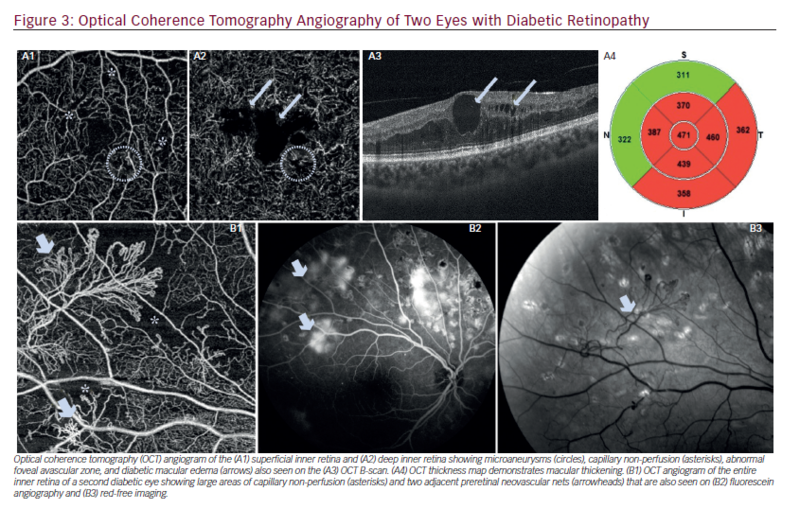 Hwang TS, Jia Y, Gao SS, et al., Optical Coherence Tomography Angiography Features of Diabetic Retinopathy, Retinao, 2015;35:2371–6. 40. Matsunaga DR, Yi JJ, Olmos De Koo L, et al., Optical Coherence Tomography Angiography of Diabetic Retinopathy in Human Subjects, Ophthalmic Surg Lasers Imaging Retina, 2015;46:796–805. 41. Freiberg FJ, Pfau M, Wons J, et al., Optical Coherence Tomography Anigography of the Foveal Avascular Zone in Diabetic Retinopathy, Graefes Arch Clin Exp Ophthalmol, 2015;doi:10.1007/s00417-015-3148-2. [Epub ahead of print]. 42. de Carlo TE, Chin AT, Bonini Filho MA, et al., Detection of Microvascular Changes in Eyes of Patients with Diabetes but Not Clinical Diabetic Retinopathy Using Optical Coherence Tomography Angiography, Retina, 2015;35:2364–70. 43. Takase N, Nozaki M, Kato A, et al., Enlargement of Foveal Avascular Zone in Diabetic Eyes Evaluated by En Face Optical Coherence Tomography Angiography, Retina, 2015;35:2377–83. 44. de Carlo TE, Bonini Filho MA, Baumal CR, et al., Evaluation of Preretinal Neovascularization in Proliferative Diabetic Retinopathy Using Optical Coherence Tomography Angiography, Ophthalmic Surg Lasers Imaging Retina, 2016;47:115–9. 46. Kashani AD, Lee SY, Moshfeghi A, et al., Optical Coherence Tomography Angiography of Retinal Venous Occlusion, Retina, 2015;35:2323–31. 47. de Castro-Abeger AH, de Carlo TE, Duker JS, Baumal CR, Optical Coherence Tomography Angiography Compared to Fluorescein Angiography in Branch Retinal Artery Occlusion, Ophthalmic Surg Lasers Imaging Retina, 2015;46:1052–4. 48. Cardoso JN, Keane PA, Sim DA, et al., Systematic Evaluation of Optical Coherence Tomography Angiography in Retinal Vein Occlusion, Am J Ophthalmol, 2015;doi: 10.1016/j. ajo.2015.11.025. [Epub ahead of print]. 49. Suzuki N, Hirano Y, Yoshida M, et al., Microvascular Abnormalities on Optical Coherence Tomography Angiography in Macular Edema Associated with Branch Retinal Vein Occlusion, Am J Ophthalmol, 2016;161:121–32. 50. Rispoli M, Savastano MC, Lumbroso B, Capillary Network Anomalies in Branch Retina Vein Occlusion on Optical Coherence Tomography Angiography, Retina, 2015;35:2332–8. 51. Sogawa K, Nagaoka T, Ishibazawa A, et al., En-face Optical Coherence Tomography Angiography of Neovascularization Elsewhere in Hemicentral Retinal Vein Occlusion, Int Med Case Rep J, 2015;8:263–6. 52. Coscas F, Glacet-Bernard A, Miere A et al., Optical Coherence Tomography Angiography in Retinal Vein Occlusion: Evaluation of Superficial and Deep Capillary Plexa, Am J Ophthalmol, 2016;161:160–71. 53. Spaide RF, Klancnik JM, Cooney MJ, Retinal Vascular Layers in Macular Telangiectasia Type 2 Imaged by Optical Coherence Tomography Angiography, JAMA Ophthalmol, 2015;133:66–73. 54. Zeimer M, Gutfleisch M, Heimes B, et al., Assocation Between Changes in Macular Vasculature in Optical Coherence Tomography- and Fluorescein- Angiography and Distribution of Macular Pigment in Type 2 Idiopathic Macular Telangiectasia, Retina, 2015;35:2307–16. 55. Thorell MR, Zhang Q, Huang Y, et al., Swept-Source OCT Angiography of Macular Telangiectasia Type 2, Ophthalmic Surg Lasers Imaging Retina, 2014;45:369–80. 56. Chidambara L, Gadde SGK, Yadav NK, et al., Characteristics and Quantification of Vascular Changes in Macular Telangiectasia Type 2 on Optical Coherence Tomography Angiography, Br J Ophthalmol, 2016;doi: 10.1136/bjophthalmol-2015-307941[Epub ahead of print]. 57. Gaudric A, Krivosic V, Tadayoni R, Outer Retina Capillary Invasion and Ellipsoid Zone Loss in Macular Telangiectasia Type 2 Imaged by Optical Coherence Tomography Angiography, Retina, 2015;35:2300–6. 58. Spaide RF, Klancnik JM, Cooney MJ, et al., Volume-Rendering Optical Coherence Tomography Angiography of Macular Telangiectasia Type 2, Ophthalmology, 2015;122:2261–9. 59. Baumal CR, de Carlo TE, Waheed NK, et al., Sequential Optical Coherence Tomography Angiography for Diagnosis and Treatment of Choroidal Neovascularization in Multifocal Choroiditis, JAMA Ophthalmol, 2015;133:1087–90. 60. Levison AL, Baynes K, Lowder CY, Srivastava SK, OCT Angiography Identifaction of Choroidal Neovascularization Secondary to Acute Zonal Occult Outer Retinopathy, Ophthalmic Surg Lasers Imaging Retina, 2016;47:73–5. 61. Klufas MA, O’Hearn T, Sarraf D, Optical Coherence Tomography Angiography and Widefield Fundus Autofluorescence in Punctate Inner Choroidopathy, Retin Cases Brief Rep, 2015;9:323–6. 62. Ang M, Sim DA, Keane PA, et al., Optical Coherence Tomography Angiography for Anterior Segment Vascular Imaging, Ophthalmology, 2015;122:1740–7. 63. Ang M, Cai Y, Shahipasand S, et al., En Face Optical Coherence Tomography Angiography for Corneal Neovascularization, Br J Ophthalmol, 2015;doi:10.1136/bjophthalmol-2015-307338 [Epub ahead of print]. 64. Ang M, Cai Y, MacPhee B, et al., Optical Coherence Tomography Angiography and Indocyanine Green Angiography for Corneal Neovascularization,Br J Ophthalmol, 2016;doi:10.1136/ bjophthalmol-2015-307706 [Epub ahead of print]. 65. Jia Y, Morrison JC, Tokayer J, et al., Quantitative OCT Angiography of Optic Nerve Head Blood Flow, Biomed Opt Express, 2012;3:3127–37. 66. Liu L, Jia Y, Takusagawa HL, et al., Optical Coherence Tomography Angiography of the Peripapillary Retina in Glaucoma, JAMA Ophthalmol, 2015;133:1045–52. 67. Jia Y, Wei E, Wang X, et al., Optical Coherence Tomography Angiography of Optic Disc Perfusion in Glaucoma, Ophthalmology, 2014;121:1322–32.